The Iphigenia Quartet at Gate Theatre. Photo: Helen Murray. The House of Atreus is having a bit of a moment. The Gate’s exploration of the unhappy family comes off the back of 2015, henceforth to be known as The Year of The Three Oresteias, and opens concurrently with Zinnie Harris’ retelling, This Restless House, currently playing at Glasgow Citz – and the Gate’s project is a bold attempt at examining the persistence of the story. The Iphigenia Quartet consists of four new plays produced by four different writer-director pairings, each re-telling how (2500 year old spoilers) Iphigenia, the young Greek princess, is sacrificed to bring the winds that will blow the Greek ships to Troy. The four plays unfold like a gory pop-up book: the same characters, the same place, the same outcome unfurl themselves in four different directions with results that are sometimes fascinating, often intellectually provocative, but frustratingly hamstrung by the format. It is worth noting that the performance I watched was a one-off event: the only time all four plays are being performed together. For the rest of the run, they will be split into pairs: Caroline Bird’s Agamemnon with Lulu Razcka’s Clytemnestra, Suhayla El-Bushra’s Iphigenia with Chris Thorpe’s Chorus. Each pairing offers a linear retelling alongside a fragmented one, though in a pleasingly circular touch it is the formally experimental plays (Raczka’s and Thorpe’s) that seem to pick up most immediately the challenge of form that Ancient Greek drama lays down. It is also no surprise that Raczka and Thorpe’s contributions are the most vital, exploding the play and picking through fragments in their short running times; Bird’s and El-Bushra’s more conventional retellings are groaning with unrealised potential, aching to take flight into full productions in their own right. Having said that, it’s almost a shame that every evening won’t begin with Bird’s Agamemnon, not only for the faithful clarity with which it reminds you of events, making it feel like a de facto introduction to the evening as a whole, but for the tone-setting worn-down grottiness of it. Bird strips the Atreus brothers, and the play, of any inherent nobility, presenting them as a grotesque double act, Andrew French’s Agamemnon revealing an ugly strain of self-preservation and Nigel Barrett’s slightly camp, fast-talking Menelaus something akin to Robert Downey Jr’s Tony Stark. However, Bird’s distinct, idiolectic prose is delivered with the heavy, stichomythic insistency of the most dusty of verse, halting its fluency dead. 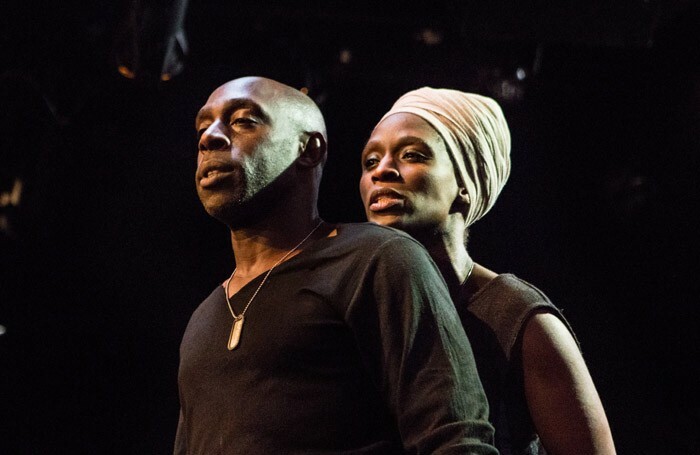 Fortunately, the arrival of Sharon Duncan-Brewster’s strutting WAG Clytemnestra lights a fire under things, the moment when she removes her weave to confront her husband with his past misdeeds startlingly raw. This is an evening of echoes and ripples between four different storytellers, and one of the most profound of those echoes is a shared fascination with Clytemnestra, perhaps indicative of a broader concern with the story’s bloody sexual politics. Lulu Rackza’s anxious, angry Clytemnestra presents two gatekeepers of Western culture, a male Hollywood director and a female academic, struggling with a personal response to the moment in Euripides’ Iphigenia in Aulis where Clytemnestra apparently waits outside the temple door as her daughter is sacrificed. It is the closest the evening comes to a true treatise on grief, fracturing the experience of loss through a series of ‘what if’ moments; in that respect it recalls the Gate’s previous, joyful, Idomeneus (enhanced by the presence of a unhappily inquisitive Susie Trayling as the questing academic), frantically re-calculating events as though running algorithms through a computer program, trying to find the best – or least worst – outcome. It is gorgeously complex, joining the contemporary voices with the ancient accounts of a maid and a soldier, offering Clytemnestra as a feminist heroine (and perhaps, in its film director’s pitch, invoking the commercial branding of feminism), at the same time as it suggests, with its final section where a characterless disembodied voice breaks down in the search for objectivity, that this too is nothing more than interpretation, one perspective amongst many. Suhayla El-Bushra’s Iphigenia picks up the Clytemnestra theme again, re-figuring her as a restless housewife and mother wrapped in her own failures, taking her as far as possible from the post-Troy revenger who slaughters Agamemnon in his bath. El-Bushra’s play is a frustrating thing: where the other three plays write on and dismantle Iphigenia’s body, this one gives her a roaring voice, proffering the tantalising interpretation that her death is truly heroic. Rebecca Hill’s production, slightly weighed down under a proliferation of props and costume, doesn’t quite grab at this possibility with the same ballsy disregard for tragedy, leaving us instead with the sense that Iphigenia might simply have drunk the Grecian Kool Aid. There are strains of Robert Icke’s Oresteia running through it, in its broad yet recognisable relocation of the story to a just about contemporary First Family, and its appropriation of the contemporary politics of fear in its descriptions of Trojans as “fanatical”, but with its necessarily compact running time, it never has the same scope to take off. Chris Thorpe’s Chorus is, unsurprisingly, brilliant – but being handed the play marked ‘Chorus’ is in some ways the juiciest assignment of the four. In neat, greedy quatrains, the gossipy elders of Euripides become an internet comments section, a message board, Tumblr, Reddit, YouTube, below the line on The Guardian website, a global chorus, voice flicking restively from a TV repairman in Lagos to a market trader in Phnom Penh. It comments on the truest universality of all and how that is enabled by online anonymity: voyeurism without consequence. Coming at the end of the evening, it is a masterstroke, transfiguring our own audience spectatorship into something uglier, a reminder that we too have just sat and watched a teenager being butchered four times over. Elayce Ismail directs with a steady hand, allowing the screen-filtered horror to build in a slow relentless crescendo as the cast shed sweet wrappers, shredded tissues and clothes. It is remarkable how un-nourishing Thorpe and Ismail make the story, a far cry from the stone edifice of Culture that Euripides’ play has become. It shares with Raczka’s play an acknowledgement of our desire for objectivity, to consume facts like the Chorus’ sweets, and the part an online 24-hour news cycle has played in dimming our capacity for what Keats called negative capability – being in a state of doubts and uncertainties. But although all four pieces are incisive and inventive, and two pretty brilliant, it is ultimately the format that stops the evening from being truly revelatory. A quartet suggests four distinct but harmonious voices, co-operating, playing in tandem. It is the way the pieces exist on separate planes that is least satisfying and I longed for greater cohesion between them: not four single voices, but a conversation. With stage management reappearing to reset the space to emptiness at the start of each one, so too is our comprehension and engagement with the story reset, and it becomes difficult to feel like a cumulative understanding is gathering. This is an Iphigenia-themed scratch night, a project, a portfolio. Cécile Trémolières’ design is moodily male, dark tones of a hunting lodge accentuated by a series of gold antlers hanging from the walls around an ominously sacrificial-looking podium. There is a sense, though, of waiting for it to spring into life – an expectation born out of her previous work that we are waiting for the moment when it moves or transfigures, when something ruptures. Here again is the limitation of the format felt: with the design required to function identically for all four pieces, such a moment of blossoming never comes. The Iphigenia Quartet is on until 21st May 2016. Click here for more information.